the most important interest field. tion and structure characteristics [5-9]. fabricated sample with a mixed electrode. permittivity (8.85 × 10–12 F/m) in the free space. 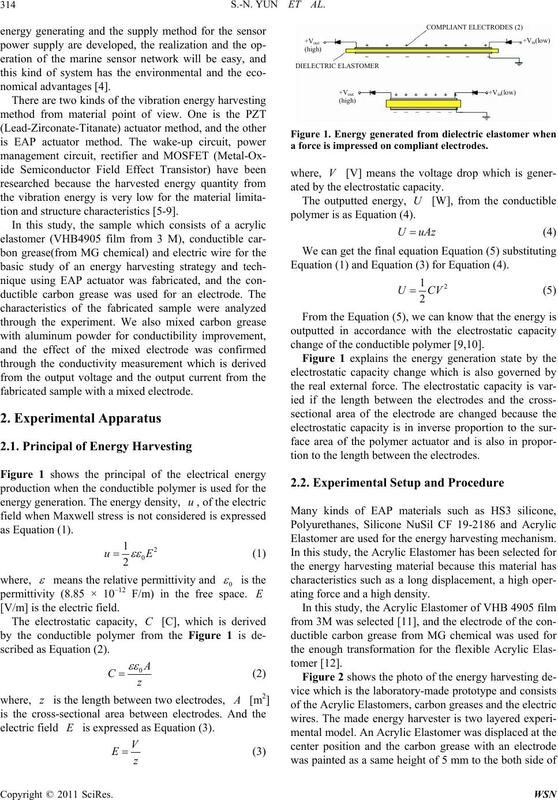 [V/m] is the electric field. electric field is expressed as Equation (3). 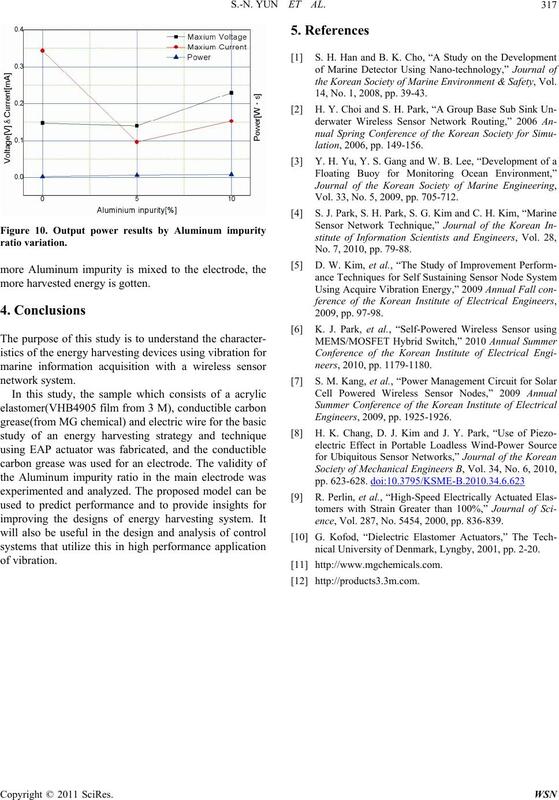 a force is impressed on compliant electrodes. ated by the electrostatic capacity. polymer is as Equation (4). Equation (1) and Equation (3) for Equation (4). change of the conductible polymer [9,10]. tion to the length between the electrodes. Elastomer are used for the energy harvesting mechanism. ating force and a high density. Figure 2. 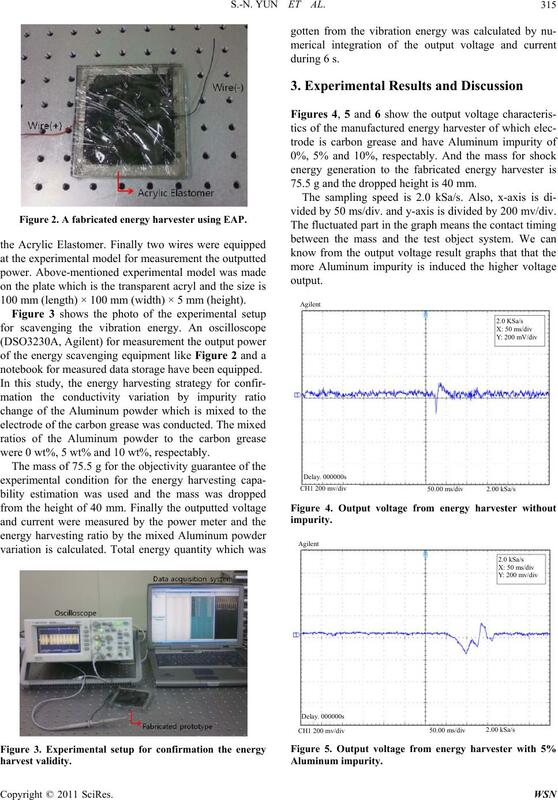 A fabricated energy harvester using EAP. 100 mm (length) × 100 mm (width) × 5 mm (height). notebook for measured data storage have been equipped. were 0 wt%, 5 wt% and 10 wt%, respectably. 75.5 g and the dropped height is 40 mm. vided by 50 ms/div. and y-axis is divided by 200 mv/div. ms/div. and y-axis scale 200 mv/div. rived from the energy harvester during 6 s.
Table 1. 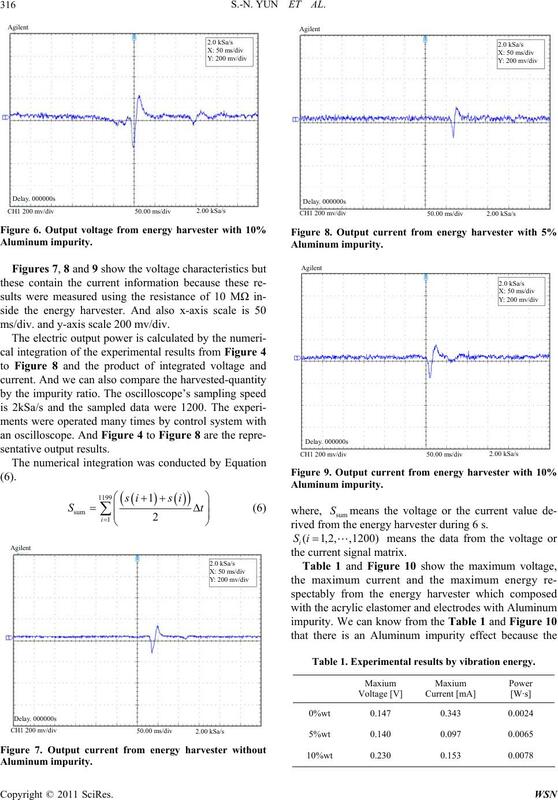 Experimental results by vibration energy . 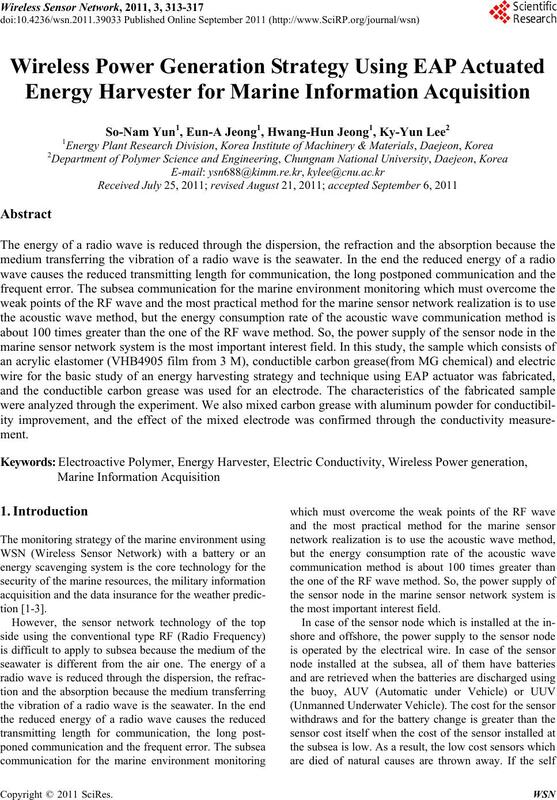 the Korean Society of Marine Environment & Safety, Vol. 14, No. 1, 2008, pp. 39-43. Vol. 33, No. 5, 2009, pp. 705-712. No. 7, 2010, pp. 79-88.
more harvested energy is gotten. ence, Vol. 287, No. 5454, 2000, pp. 836-839.
nical University of Denmark, Lyngby, 2001, pp. 2-20.